Five students in a dance rehearsal simultaneously reached their arms wide and twisted their torsos like synchronized miniature windmills. Moments later, they walked in angled trajectories, crouched while clapping hypnotic rhythms, and hovered above the floor on toes and forearms. On a recent Sunday afternoon, these dancers were rehearsing a piece for the Dancing Uphill 2019 concert at the University of Vermont. Choreographed by UVM sophomore Chloe Schafer, the work is one of nine that will be presented Wednesday through Saturday, March 20 through 23, in Mann Hall on the Trinity Campus by students in the UVM Department of Music and Dance. Created by students, faculty members and guest artist Alexander Hille, a former principal dancer with Les Ballets Jazz de Montréal, the concert's works demonstrate how far UVM's academic dance program has come in the past 13 years. The show also highlights two recent achievements. Despite the College of Arts and Sciences' significant financial struggles, as reported last year by Seven Days, the UVM Board of Trustees just approved a new bachelor's degree in dance, available to students in September. The other development: the opening last fall of a sprung-floor dance studio in Cohen Hall, on the west side of campus. While many faculty and staff members helped reach these milestones, they credited dance professor Paul Besaw with providing the foresight and leadership to bring the new degree to fruition. "This is all thanks to Paul's vision and unrelenting hard work in course planning and dance faculty hiring," wrote UVM music professor Patricia Julien by email. Since coming to UVM in 2006, she wrote, "he has accomplished a tremendous amount." Besaw became chair of the music and dance department last fall. Collaborative and humble by nature, he attributes the dance program's growth and success to students and faculty. For example, in his first year at UVM, he was surprised by students' "openness and readiness" to participate in the American College Dance Association New England Regional Conference, an annual event where students showcase new pieces. "Without even trying," said Besaw, "I had seven students who wanted to go, and we figured out a way to share some work." Every year since, UVM students have performed at the conference, where they also interact with students and faculty from other dance programs. Since 2008, four UVM student choreographers' works have been selected for juried performances at the biennial ACDA regional gala concert. Early in his tenure, Besaw forged collaborations with faculty in music and other university departments. He credits theater professor John Forbes, for example, with providing lighting equipment and design for the Dancing Uphill 2008 student concert, and many since. Besaw also lauds fellow dance faculty who have expanded the curriculum and helped create an inclusive culture. Clare Byrne, who taught contemporary, improvisation, site-specific dance and other courses for 10 years, until she moved to Connecticut in May 2018, "shored up this focus on students, on student work," said Besaw. He and Byrne agreed to "let them do what they wanted to do while guiding them in certain ways." The artistic differences between Byrne and Besaw enriched student learning. "She and I became a mutual admiration society," and students noticed it, said Besaw. "We were doing different kinds of work but very much respecting and rooting for each other. It built an environment that I think works at UVM." He also appreciated Byrne's support for his leadership: "She helped me feel confident about every one of my inklings." The feeling was mutual. 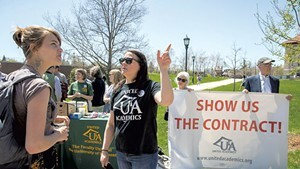 When interacting with fellow faculty, "He doesn't want the spotlight," Byrne said of Besaw. "He wants to be your fan club." Besaw consistently championed Byrne's creative work and new courses she designed and offered. "He wants you to do your thing, and he really supports you doing your thing," she said. "He's empowering you and maybe shaping it just a little bit." Paula Higa, a third faculty member, who joined the program in 2011, expanded course offerings and cultural diversity by teaching ballet and Brazilian dance. When she became a full-time lecturer a few years ago, Besaw said, "We had built the curriculum that could support a bachelor of arts." Acquiring a designated dance space was the final component of such a program. Michele and Martin Cohen made a multimillion-dollar donation to the university to repurpose a former elementary school on the corner of Williams and Pearl streets as a multidisciplinary arts facility. Its former gym now has a sprung dance floor and will eventually become a black-box theater for dance, theater and other departments to use. "Part of the sell was that we weren't asking for any more resources," said Besaw. "It didn't cost the university anything to create the major." On that afternoon in Cohen Hall, choreographer Schafer received feedback from Besaw and Higa after the day's first run-through of her piece. "The more energy you build there, the better," said Besaw of a climax in the work. "It's captivating, so anything unique stands out," said Higa, encouraging movement that was more complete and precise. Based on this feedback and her own observations, Schafer asked her dancers to make changes in blocking, focus and the quality of their movement. "Try to be less swoopy," she said, "and watch each other for unison and timing." Schafer, a double minor in anthropology and dance (currently a self-designed major), brings extensive dance performance experience to the task, but this is the first time she has choreographed a piece for as many as five dancers. She created the work for three during a fall dance composition course; Besaw and Higa challenged her to add more dancers and develop it further. "It's not that we want them to create a masterpiece; it's about the process," said Higa. In addition to teaching UVM students about dance, culture and history, faculty help rookie choreographers learn the craft. "How do you talk to your dancers? How do you get more from your dancers?" Higa said, elaborating on that process. "Every year, there's a maturity shift, where [students] are ready for what it is to revise something," said Besaw. 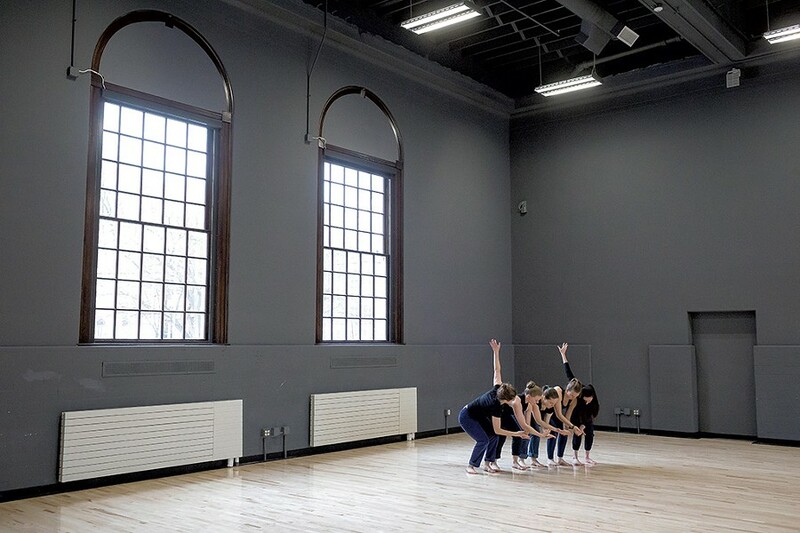 The newest instructor in the program believes the BA will flourish both because of its proximity to dance communities in Montréal, Boston and New York City and because of its unique design. Students are "not locked into a pathway," said choreographer and performer Julian Barnett, the current dance artist-in-residence. Unlike other dance BAs with specific sequences of study, the UVM major will allow students to build their own focus, "because they are the ones who are going to understand how ballet and hip-hop go together," suggested Besaw. Students can take courses in everything from African forms to capoeira, contemporary dance to site performance, world dance to dance history. Two courses — musical-theater dance and Asian theater and dance — are cross-listed with the theater department. "The goal of the program is to welcome all students regardless of identity, race, gender, body type, accent," said Higa. "We are here to welcome everyone who enjoys the art of dance." Barnett, who has taught at Princeton University, the Juilliard School and, most recently, Middlebury College, believes that the UVM dance program's relatively small size — currently 40 minors at a time — confers an additional benefit. "It maintains this intimacy between faculty and students, which I feel is pretty special and unique," he said. "You really do get to build relationships with students, more so than in a large conservatory." Besaw anticipates that five to eight students will declare a dance major per year, maintaining the program's modest size. Approximately 50 students will major or minor in dance at any given time. Besaw mentioned another unique factor: UVM's dance BA will be the first one offered at a Vermont public college or university. Five student choreographers will present new works this week at Dancing Uphill. Among them is sophomore Zoey November, a natural resources major soon to add a second major in dance. Her duet with Schafer includes "detailed geometric projections [that] cover the dancers and the stage, obscuring reality and bringing shadows to the forefront," she wrote by email. Senior Abby Enders, a psychology major and dance minor, said that her jazz-inspired piece for seven dancers expresses three key things she has learned through the dance program: "confidence, fortitude and stage presence." Senior Anna Gibson, an English major, will perform a solo work inspired by her great-aunt. Moving to music by John Cage, she uses breath as a vehicle for circular movement. Students will also perform three faculty pieces. Higa's work draws on the Brazilian traditional dance baião. Barnett's infant daughter inspired his piece on beauty and dreams. And the piece by part-time instructor Lynn Ellen Schimoler is an ode to the joy of pairing food and music. The work by guest choreographer Hille "is very challenging" for the students, said Higa. "There are lots of movements going on at different tempos." UVM music students will also contribute to Dancing Uphill, as they have in many previous years. Bella and the Notables will play what the group calls "jazz standards with a twist" before each evening's show. And theater students and staff will help set up equipment and seating. For senior dance students such as Enders, the upcoming performances reflect a poignant awareness. "Growing up, dance was really the thing that I felt the best at," she said. "It gave me meaning ... some kind of sense of self. I'm so grateful for the UVM dance department for giving me the support I need and believing in me and pushing me to get here." Disclosure: Elizabeth M. Seyler was a part-time instructor in the University of Vermont's Department of Music and Dance until 2017. The original print version of this article was headlined "Sprung Forward"